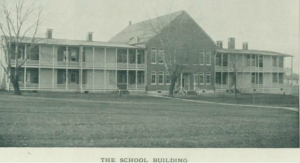 In 1902, Elmira Jerome was placed within the Carlisle Indian Industrial School in order to have her assimilate to the American ways. Henry Pratt, the founder of this school, used the school to physically and spiritually transform the Native Americans through cutting their hair, changing their clothes and Christianizing the Indian students. In result, it seemed as if some of these assimilation tactics worked because Elmira became a seamstress at a government school connected to the Bureau of Indian Affaires. However, through writing about the Pottawatomi culture Elmira is somewhat returning to her old ways. Elmira Jerome is originally from the Chippewa Nation Indian Tribe, but wrote about the Pottawatomi tribe, so it is essential to understand their connection. 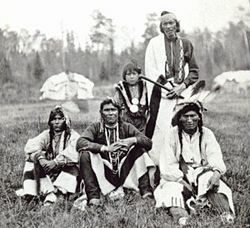 The Chippewa Indians were also known as the Ojibway Tribe (33). The Chippewa Indians were similar to the Ottawas and Pottawatomi Indians, since they were from the same Algonquin race and spoke that dialect. In particular, Elmira writes about the Pottawatomi tribe. 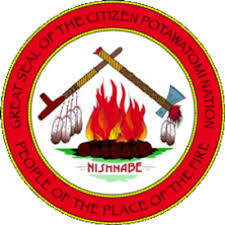 The Pottawatomi also spelled as Pottawatomie and Potawatomi, originated in the Great Lakes area of the US and was at first a part of the “Three Fires Council, which included Potawatomi, Ojibwe/Objiway (or Chippewa) and Odawa (the Anishnabek peoples)”. However, according to Citizen Pottawatomi Nation, in the 18th century the whites were taking over their tribal villages, which lead to many treaties in 1789. Their tribal estate of “eighty-nine million acres was gradually reduced in size”. 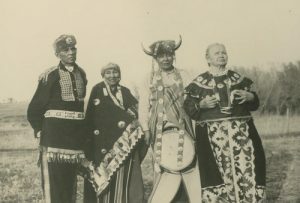 A Treaty in 1861 required the Pottawatomi to “surrender their tribal membership and adopt U.S, citizenship” which caused the creation of the Citizen Pottawatomi Nation. This Pottawatomi government organization helped preserve the culture and lives of the Pottawatomi people. The Citizen Pottawatomi Nation (CPN) is “1 of 39 federally recognized Native American tribes” located in Oklahoma. In addition to preserving the Native American culture, CPN is also a “frontrunner in Native American business”. Crops were essential to the Pottawatomi tribe, since they hunted and fished as their primary way of getting food. Women had the important role of collecting “berries, nuts, roots and wild greens” while the men had the important role of “planting and growing tobacco”. 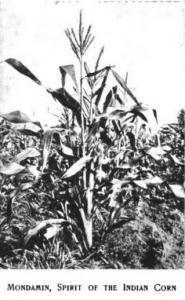 One of the important aspects of this Pottawatomi legend is the character, Mondamin, or maize. This character derives from another legend entitled “Mondamin, The Spirit of the Indian Corn” (239-246). In this story, a youth asks the Great Spirit to feed the poor, hungry Indians within his tribe. The Great Spirit then sends a messenger to grant the youth’s wish. The messenger is described as having “green and yellow garments with waving plumes upon his head” (240). The youth then had to fight and bury the messenger in order to grow corn crops for his people. In result more corn grew and the figure appears again as “Mondamin, [their] Indian Corn…[who] came to bless the earth and the many tribes that occupy it” (240). They then personify this Indian corn as a “youth, or warrior, full of life and strength” (241). Evidently, corn has because a big part of Indian culture, since “in all parts of the country, the Indian corn is largely cultivated as fodder for the cattle, and the sweet corn, roasted, for the people” (245). This entry was posted in Elmira Jerome, Tribal Educators and tagged Assimilation, Christianity, Citizen Pattawatomi Nation, Corn, Henry Pratt, Mondamin, Objiway, Odawa, Potawatomi, Pottawatomi, Pottawatomie, Spirit of the Indian Corn, The Great Spirit, Three Fires Council, Treaty. Bookmark the permalink.